Post what year, model, chassis, power train you have at the beginning of your post. Post what year, model, chassis, power train you have in a signature at the bottom. That way you only have to type it once forever. Hopefully, that will get you fast and accurate answers to your specific questions, problems. Either that or in a signature at the bottom. That way you only have to type it once forever. Here is a 5 step tutorial on how to set up a signature profile as mentioned above. 2) Click here for your personal zone - members profile page. 4) Scroll down to the Signature area and type the relevant information into the box. 5) Make sure you save it by clicking the "Submit" button! You'll need to scroll all the way down to see it. From now on, each time you post, that information will always show up on the bottom of your post. If you need help setting up your signature profile, contact me via PM or email. FYI: Everything you see below this statement, is in my signature profile. Good idea Bill, I made a few changes in my signature. I updated our profile, but where do I find the chassis information? And what is a data tag number? 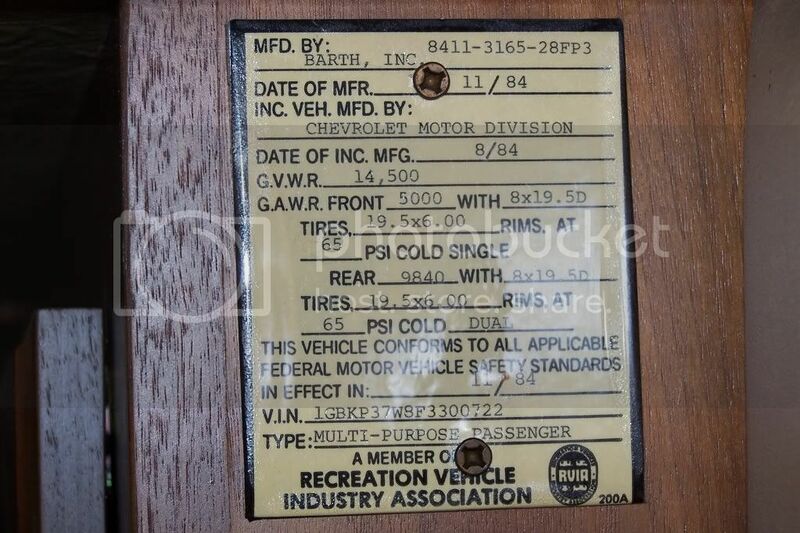 For 1978 - 1987 your tag should look like these. 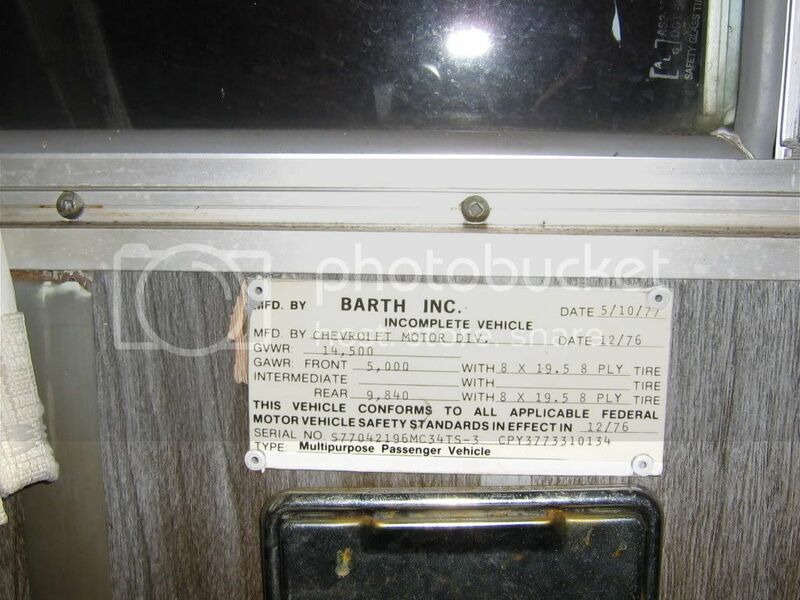 This tag is typically located around the drivers side curtain track area or lower. Could also be in an overhead cabinet around there too. An additional note: That mean that an earlier 1978 could also look like this. Or a late 1987 could also look like this. 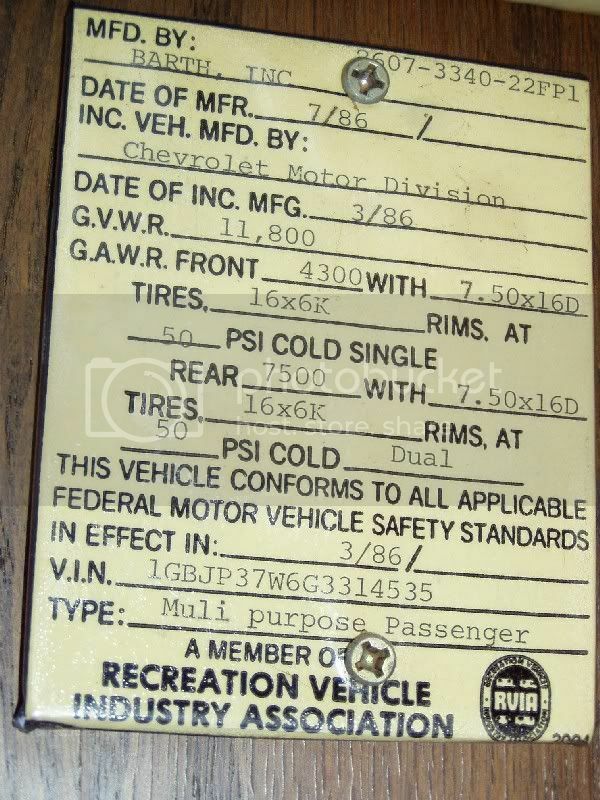 I am in the process of acquiring a set of factory manuals for the 1998 Chevy Motorhome Chassis. When I get them, I will scan them into the Mac and post it on the site. I sent Bill N.Y. a Chevy Motorhome Chassis Service Guide on DVD this morning to share. 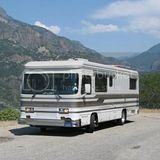 I sent Bill N.Y. a Chevy Motorhome Chassis Service Guide on DVD this morning to share. Thanks Billy... it arrived today. 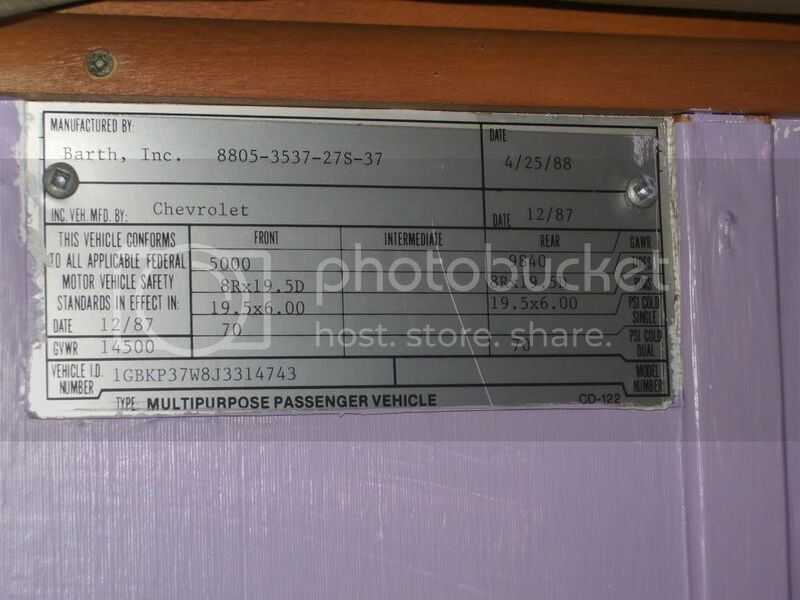 1997 Chevy Motorhome Chassis Guide. 259 pages scanned in PDF 165,453,824 bytes. Since we have a lot of new owners and forum members, it's a good time to bump this thread. 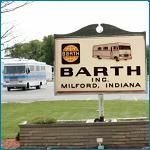 No two Barths are the same, so a complete description of the coach is the only way we know what to suggest. If your problem is with an appliance or accessory, pleased describe it by make model, fuel/power, size, etc. Shrink Pic is a free program only available for Windows, belonging to the category Design & photography software with subcategory Retouching & Optimization (more specifically Crop & Resize).